I rode a gondola last week in Austria to 6600 feet to ponder the magnificent view of the Alps and take some summer snaps. As I started walking back to the gondola station, I passed a serious hiker carrying an enormous black, cylindrical backpack, maybe four feet tall and 20 inches in diameter. He totally ignored me on the three-foot wide trail—I thought he was a bit unfriendly, as we were the only two people on the ridge. But I was awed that he was going to camp out for weeks, I thought, and had to plan so carefully, be sure to take enough food, water, countless other supplies along with the tent that was obviously crammed into his bag. I have enough trouble remembering to take a cell phone or pen when I go out for a walk. When I arrived at the gondola, the clock showed that the next descent wasn’t for 15 minutes, so I decided to go back near the ridge and throw a snowball in July while standing in the white patch of snow just near the cliff. Imagine my surprise to see this “hiker” in black maneuvering a large curved wing made of parachute-like material that was attached to his harness somehow and also by maybe 20 lines or risers half going to each hand for controlling the wing. The wind was somewhat brisk, and I took three or four videos of him trying to organize his wing and keep the lines untangled. But one end of the wing kept crashing to the ground. 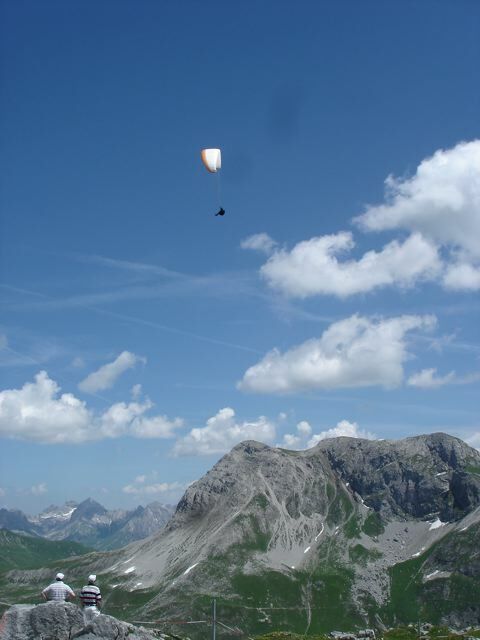 Finally he looked away from the edge, toward the wing, inflated the fabric, then reversed his direction by 180 degrees so his back was to the wing, and he ran off the cliff. 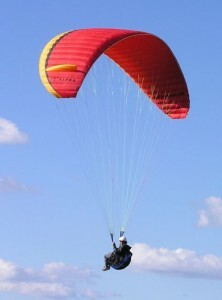 This is called a reverse launch, and the sport is called paragliding. Breathtaking. I have to admit there is a difference between watching some life-threatening, death-defying activity on TV or in photos and seeing it right up close. Even for me, after parachuting in the army. I am still wondering precisely how you learn the skill, because there must be a way to practice parts of it in advance. And what if the wind is too strong and drags you off the mountain in the opposite direction from where you intend to go? Anyway, this guy made it, and it was very exciting to watch. He fell off the cliff and out of site until a thermal (patch of hot rising air) picked him right up, and he was high above me. You could hear a slight whistling as he passed close by…right with the birds who were soaring effortlessly as well. Although thermals are perfect in this sport, I was reminded of my first week at Fort Benning Georgia in 1963, where I went to jump school. In combat jumps, the planes are stacked, so that those in front fly lower than the ones behind, presuming that by the time the second or third wave of jumpers is out of their planes, the earlier jumpers are way down toward—or on—the ground in the designated drop zone. Unfortunately when I arrived, we heard how the first jumpers met thermals and were taken up, rather than down, and were shredded and killed by the propellers of the following waves of planes. Very gruesome, and just for training, not even combat.